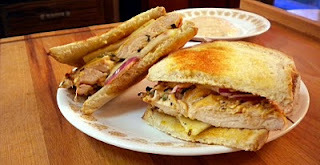 When I made my Grilled Lemon Garlic Chicken Dippers I knew I just had to make a sandwich recipe based off of it. Well this is that sandwich! I only changed a few things about the recipe and added some fixings and bread so if you loved the dippers you should like these! It is super easy to make and I hope you enjoy! Whisk together all ingredients in a medium bowl and chill until ready to use. Place chicken breast in a large ziploc bag and seal. Meat hammer chicken breast down to 1/4 inch thickness. Mix together all chicken ingredients in a medium bowl, cover and let chill in refrigerator for 30 minutes. While chicken is cooking lightly toast your bread or buns. Spread 1 tsp of Brummel and Brown onto one slice of bread or bun. Sprinkle with 1/2 of garlic powder and 1/2 of Parmesan. Repeat with another slice of bread and top both slices of bread with an onion slice. Spread 1-2 tbsp of sauce onto the remaining to slices of bread, sprinkle 1/2 of sunsdried tomatoes over sauce, sprinkle 1/2 of baby spinach leaves over tomatoes and top with cheese slice. Remove chicken from grill and put on bread to make cheese melt. Once cheese is melting (1-2 minutes) serve hot. Enjoy!